A rendering of a possible design for the 20th Street Park. CHELSEA — The city is considering moving a planned affordable housing complex on West 20th Street to another location, which could clear the way for a long-desired park on the city-owned lot. For more than four years, neighborhood advocates have pushed the city to build a park at the 10,000-square foot former Sanitation Department lot at 136 W. 20th St., but the city maintained that it had been designated a spot for affordable housing in 2010. In 2011, the city's Department of Housing Preservation and Development rejected 26 alternative affordable housing sites put forward by the Friends of 20th Street Park and former City Council Speaker Christine Quinn. But thanks to some new political pressure, the agency is reconsidering its stance. "Affordable housing is important to working-class New York families who are looking to maintain a foothold in an area that has been growing rapidly," HPD spokesman Eric Bederman said in a statement to DNAinfo New York this week. "We also understand the need for green space and parks and the benefits they can provide to a community," Bederman's statement continued. "HPD has been meeting with [City Councilman Corey] Johnson who has discussed ideas of possible alternate sites, and we are working with his office to assess whether any are feasible for affordable housing development." HPD did not respond to questions about how many affordable housing units were planned for the 20th Street lot and why the project has not yet broken ground. More than 4,000 people have signed a petition asking the city to build a park on the lot, and advocates say that it would provide much-needed open space to a neighborhood that lacks parks. "This area is seeing an explosion of residential population and as a result needs to add more recreation space, for children and for seniors," said Matt Weiss of Friends of 20th Street Park. 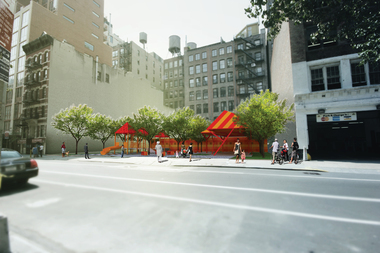 The closest parks are far away, Weiss said, and even the popular Evelyn Playground in Union Square had to close down for weeks of repairs in the spring. Weiss credited the park's recent progress to efforts by the neighborhood's new elected officials, including Johnson and state Sen. Brad Hoylman. Parents from two new schools in the area — P.S. 340 at the Foundling Hospital site and a new middle school slated for East 15th Street — have also joined the cause. "We have new political officials in just about every seat who are really working with the community on this issue," Weiss said. The group plans to continue its efforts by making the spot a community space, even if the city hasn't officially designated it one. The group has hosted events and "pop-up parks" on the sidewalk just outside the lot and posts photos of the free-range weeds and vines growing there on its Facebook page. "At the end of the day this is what a park is all about," Weiss said. "It’s a gathering place for people of all backgrounds and walks of life."